双语：世界最健康的驴奶酪 每公斤售880英镑 - 休闲乐园 - 英语听力论坛 -英语听力,英语学习 - Powered by Discuz! It's the most expensive cheese in the world, produced by just one farm in Serbia, but donkey cheese could be the next cult food item. Although incredibly rare, the cheese is being hailed as a health food thanks to its nutritional value - donkey milk is exceptionally high in protein, calcium and omega 3 fatty acids, which in turn are extremely good for maintaining cardiovascular health. With more and more people claiming to have an intolerance to cow's milk and cheese, the donkey alternative is becoming an increasingly attractive option. However donkey cheese's hefty price tag means it's unlikely you're going to see it on the shelves of your local Sainsbury's any time soon - the cheese costs 880 per kilo. 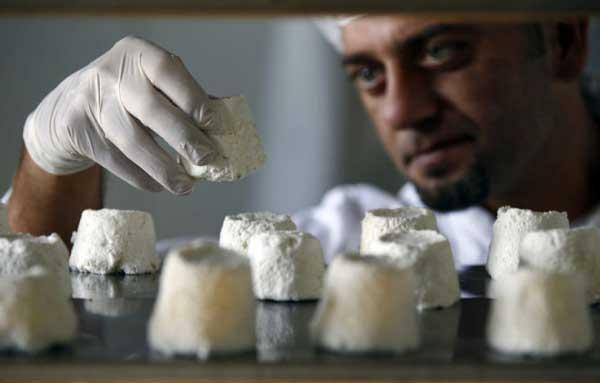 Slobodan Simi is the world's only producer of donkey cheese - he does it all on his farm in Zasavica, 50 miles west of the Serbian capital Belgrade. Despite starting out with just 12 donkeys 16 years ago, Simi 's herd has now grown to nearly 300. The reason the cheese, known as pule, is so expensive is that it takes 25 litres of fresh donkey milk to make a single litre of cheese. What's more, donkeys produce a lot less milk than cows or goats to start with. On Simi ’s farm, the female donkeys are milked by hand three times a day. But the difficulty in creating cheese lies in the fact that donkey milk doesn't have enough casein to coagulate - how Simi gets around this is a closely-guarded secret. Although not many people in the world have tasted the rare cheese, it is said to be similar to Manchego with a rich, nutty, earthy flavour and a crumbly texture. One person who is a fan of the filling cheese, however, is Novak Djokovic, who was a few years ago reported to have bought the whole supply, a claim he denied. And if legend is to be believed, Queen Cleopatra was also a fan - she is said to have bathed in asses milk to maintain her beauty. Donkey milk has a number of health benefits which make it superior to cow's milk - it has 60 times as much vitamin C as the more common milk. Donkey milk also has anti-allergen properties and is just 1% fat. What's more, it's been claimed that consuming even just a tiny amount daily can help tackle asthma and bronchitis. But unless it becomes cheaper to produce, it's unlikely donkey cheese is going to give the wider population a health-boost any time soon. GMT+8, 2019-4-19 14:51, Processed in 0.019250 second(s), 4 queries, Gzip enabled.